For other alliances with similar names, see Holy League. The coats of arms of the leaders of the Holy League (Habsburg Spain, Pope Pius V, Republic of Venice, John of Austria) as depicted in the printed order of battle published on 14 November 1571 by Antonio Lafreri in Rome. the Duchy of Parma under Ottavio Farnese. 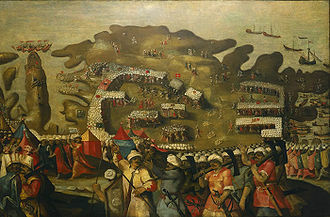 The League initially assembled a fleet to aid the Venetian defenders of Cyprus which was invaded by Ottoman forces under the command of Lala Mustafa in July 1570, but was too late to prevent the island's capture by the Ottomans. On 7 October 1571, the League won a decisive victory over the Ottoman fleet at the Battle of Lepanto in the Gulf of Patras. 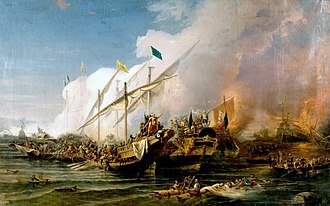 The fleet of the Holy League in this engagement consisted of 212 warships (206 galleys and 6 galleasses, the modern large galleys developed by Venice) with 1,815 guns and manned by 28,500 infantry. The majority of warships was Venetian (6 galleasses, 109 galleys), the next largest contingent were Spanish (49 galleys, including 26 galleys from Naples, Sicily and other Italian territories), and Genoese (27 galleys), with additional warships from the Papal States (seven galleys), the Order of Saint Stephen from the Grand Duchy of Tuscany (five galleys), the Duchy of Savoy and the Knights of Malta (three galleys each), and some privately owned galleys in Spanish service. The victory at Lepanto confirmed the de facto division of the Mediterranean, with the eastern half under firm Ottoman control and the western under the Habsburgs and their Italian allies. 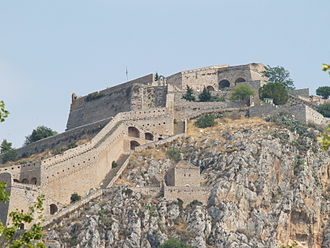 The following year, as the allied Christian fleet resumed operations, it faced a renewed Ottoman navy of 200 vessels under Kılıç Ali Pasha, but the Ottoman commander actively avoided to engage the allied fleet and headed for the safety of the fortress of Modon. The arrival of the Spanish squadron of 55 ships evened the numbers on both sides and opened the opportunity for a decisive blow, but friction among the Christian leaders and the reluctance of Don John squandered the opportunity. Pius V died on 1 May 1572. The diverging interests of the League members began to show, and the alliance began to unravel. In 1573, the Holy League fleet failed to sail altogether; instead, Don John attacked and took Tunis, only for it to be retaken by the Ottomans in 1574. Venice, fearing the loss of her Dalmatian possessions and a possible invasion of Friuli, and eager to cut her losses and resume the trade with the Ottoman Empire, initiated unilateral negotiations with the Porte. The Holy League was disbanded with the peace treaty of 7 March 1573, which concluded the War of Cyprus. ^ The image shown is a reproduction of an 1888 watercolor drawn from a copy of the banner in the Museo Naval in Madrid. F. Javier Campos y Fernández de Sevilla, "Cervanted, Lepanto y el Escorial"
^ "Battle of Lepanto (1571)". Encyclopædia Britannica. Retrieved 8 October 2013. ^ The Story of Don John of Austria – Luis Coloma, SJ, trans. Lady Moreton, (New York: John Lane Company, 1912), pp. 265–71. ^ Abulafia, David (2012). The Great Sea: A Human History of the Mediterranean. Penguin Books. p. 451. ^ * Guilmartin, John F. (2003). Galleons and Galleys: Gunpowder and the Changing Face of Warfare at Sea, 1300–1650. Cassell. pp. 149–50. ^ Finkel, Caroline (2006). Osman's Dream: The Story of the Ottoman Empire 1300–1923. London: John Murray. p. 161. Setton, Kenneth M. (1984). The Papacy and the Levant (1204–1571), Vol. III: The Sixteenth Century. DIANE Publishing. pp. 1093–95. Loretta Turner Johnson, The Holy League of 1571: The Diplomatic Background of the Battle of Lepanto (1969). Luis Coloma, The Story of Don John of Austria, trans. Lady Moreton, (New York: John Lane Company, 1912), pp. 265–71 (online transcription). Braudel, Fernand, trans. Siân Reynolds, The Mediterranean and the Mediterranean World in the Age of Philip II, 2 volumes, London: Collins (1972/3). Robert Wilde, Holy Leagues Of The 16th Century about.com (2001). The Malacca Sultanate was a Malay sultanate centred in the modern-day state of Malacca, Malaysia. Conventional historical thesis marks c.1400 as the year of the sultanate by a renegade Malay Raja of Singapura, Parameswara who was known as Iskandar Shah. As a bustling trading port, Malacca emerged as a centre for Islamic learning and dissemination. The legacy of the political and cultural legacy remains to this day. For centuries, Malacca has been held up as an exemplar of Malay-Muslim civilisation, the series of raids launched by the Chola Empire in the 11th century had weakened the once glorious empire of Srivijaya. By the end of the 13th century, the already fragmented Srivijaya caught the attention of the expansionist Javanese King, in 1275, he decreed the Pamalayu expedition to overrun Sumatra. By 1288, Singhasari naval expeditionary forces successfully sacked Jambi and Palembang, the complete destruction of Srivijaya caused the diaspora of the Srivijayan princes and nobles. 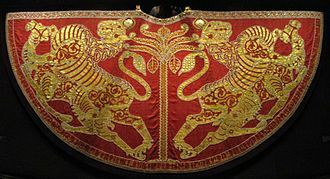 Rebellions against the Javanese rule ensued and attempts were made by the fleeing Malay princes to revive the empire, the Orang Laut, famous for their loyal services to Srivijaya, eventually made him king of a new kingdom called Singapura. 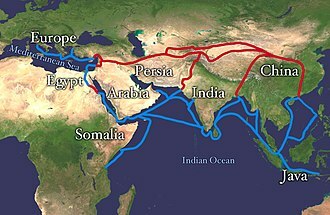 In the 14th century, Singapura developed concurrently with the Pax Mongolica era and its wealth and success however, alarmed two regional powers at that time, Ayuthaya from the north and Majapahit from the south. As a result, the fortified capital was attacked by at least two major foreign invasions before it was finally sacked by Majapahit in 1398. The fifth and last king, Parameswara fled to the west coast of the Malay Peninsula, Parameswara fled north to Muar, Ujong Tanah and Biawak Busuk before reaching a fishing village at the mouth of Bertam river. Legend has it that the king saw a mouse deer outwit his hunting dog into the water when he was resting under the Malacca tree. He thought this boded well, this place is excellent, even the mouse deer is formidable, tradition holds that he named the settlement after the tree he was leaning against while witnessing the portentous event. Today, the deer is part of modern Malaccas coat of arms. The name Malacca itself was derived from the fruit-bearing Melaka tree scientifically termed as Phyllanthus emblica, following establishment of his new city in Malacca, Parameswara initiated the development of the place and laid the foundation of a trade port. The Grand Duchy of Tuscany was a central Italian monarchy that existed, with interruptions, from 1569 to 1859, replacing the Duchy of Florence. The grand duchys capital was Florence, Tuscany was nominally a state of the Holy Roman Empire until the Treaty of Campo Formio in 1797. Initially, Tuscany was ruled by the House of Medici until the extinction of its branch in 1737. The Medicis only advancement in the days of their existence was their elevation to royalty, by the Holy Roman Emperor. 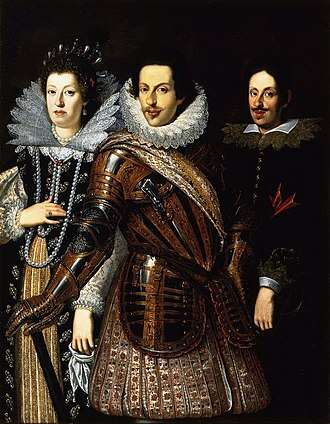 Francis Stephen of Lorraine, a descendant of the Medici, succeeded the family. Tuscany was governed by a viceroy, Marc de Beauvau-Craon, for his entire rule and his descendants ruled, and resided in, the grand duchy until 1859, barring one interruption, when Napoleon Bonaparte gave Tuscany to the House of Bourbon-Parma. Following the collapse of the Napoleonic system in 1814, the duchy was restored. The United Provinces of Central Italy, a client state of the Kingdom of Sardinia-Piedmont, Tuscany was formally annexed to Sardinia in 1860, following a landslide referendum, in which 95% of voters approved. In 1569, Cosimo de Medici had ruled the Duchy of Florence for 32 years, during his reign, Florence purchased the island of Elba from the Republic of Genoa, conquered Siena and developed a well-equipped and powerful naval base on Elba. Cosimo banned the clergy from holding positions and promulgated laws of freedom of religion. Cosimo was a supporter of Pope Pius V, who in the light of Florences expansion in August 1569 declared Cosimo Grand Duke of Tuscany. The international reaction to Cosimos elevation was bleak, Queen Catherine of France, though herself a Medici, viewed Cosimo with the utmost disdain. Rumours circulated at the Viennese court that had Cosimo as a candidate for King of England, Maximilian II, Holy Roman Emperor and King Philip II of Spain reacting quite angrily, as Florence was an Imperial fief and declared Pius Vs actions invalid. However, Maximilian eventually confirmed the elevation with an Imperial diploma in 1576, during the Holy League of 1571, Cosimo fought against the Ottoman Empire, siding with the Holy Roman Empire. He became a military leader in the service of his half-brother, King Philip II of Spain and is best known for his role as the admiral of the Holy Alliance fleet at the Battle of Lepanto. The date of his birth is unknown, with sources indicating that he was born in the year 1545 and others, like G. Parker or P. Pierson. Pierson makes mention that some contemporaries affirmed that he was born in 1545, but that the oldest evidence found in France with regards to public ceremonies, supports the date of 1547. It is likely that John of Austria was conceived in May 1546, when Emperor Charles V was in Regensburg and it is possible that John had deliberately chosen the 24th of February as his birthday, which was the month and day of his father Charles Vs birth. 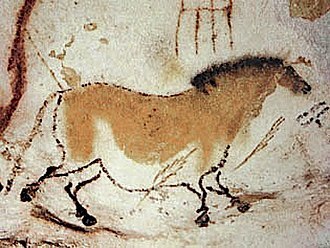 Shortly after giving birth, Barbara Blomberg was quickly married to Hieronymus Kegel, John of Austrias original name as a child, Geronimo or Jeromín, was an allusion to his stepfather. Charles V decided that his son should be raised in Spain away from his mother and his Majordomo, Luis de Quijada, had reached an agreement with Francisco Massy, a violist of the imperial court, and married to a Spanish woman, Ana de Medina. In exchange for an income of 50 ducats, the couple had agreed to raise the child. 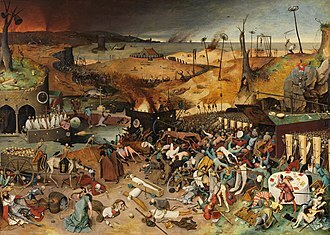 In mid-1551 they together had arrived in Leganés, where Ana de Medina had property, in the summer of 1554, the boy was taken to the castle of Luis de Quijada in Villagarcía de Campos, Valladolid. His wife, Magdalena de Ulloa, took charge of his education, assisted by the Latin teacher Guillén Prieto, the chaplain García de Morales and the squire Juan Galarza. Charles V wrote a codicil, dated 6 June 1554, in which he recognized, For since I was in Germany, after being widowed, I had a child of one unmarried woman. 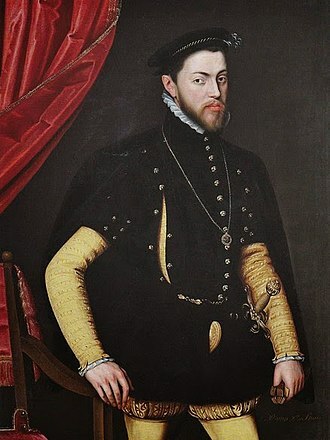 In the summer of 1558, Charles V had ordered Luis de Quijada, his wife Magdalena de Ulloa, the Emperor was already residing nearby at the Monastery of Yuste. 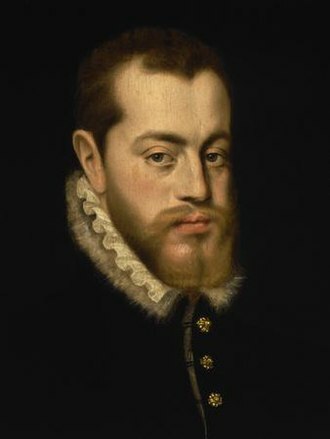 From that time forward, and until his own death in September of that year, Charles Vs only surviving legitimate son and heir, now King Philip II after his fathers abdication, was outside of Spain. Rumors had spread about the paternity of the child, which de Quijada had denied, Charles V replied with a note written by his personal secretary Eraso, in whose erasures and amendments were expressed, the Emperors thoughts about how best to deal with such a delicate matter. A galley is a type of ship that is propelled mainly by rowing. The galley is characterized by its long, slender hull, shallow draft, virtually all types of galleys had sails that could be used in favorable winds, but human strength was always the primary method of propulsion. This allowed galleys to navigate independently of winds and currents, Galleys were the warships used by the early Mediterranean naval powers, including the Greeks and Romans. 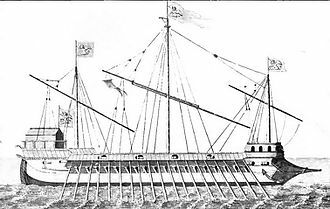 They remained the dominant types of vessels used for war and piracy in the Mediterranean Sea until the last decades of the 16th century and they were the first ships to effectively use heavy cannons as anti-ship weapons. As highly efficient gun platforms they forced changes in the design of medieval seaside fortresses as well as refinement of sailing warships. The zenith of galley usage in warfare came in the late 16th century with battles like that at Lepanto in 1571, by the 17th century, sailing ships and hybrid ships like the xebec displaced galleys in naval warfare. From the mid-16th century galleys were in intermittent use in the Baltic Sea, with its short distances, there was a minor revival of galley warfare in the 18th century in the wars between Russia and Denmark. The term galley derives from the medieval Greek galea, a version of the dromon. The origin of the Greek word is unclear but could possibly be related to galeos, the word galley has been attested in English from c. It was only from the 16th century that a unified galley concept came in use, before that, particularly in antiquity, there was a wide variety of terms used for different types of galleys. Ancient galleys were named according to the number of oars, the number of banks of oars or lines of rowers, the terms are based on contemporary language use combined with more recent compounds of Greek and Latin words. 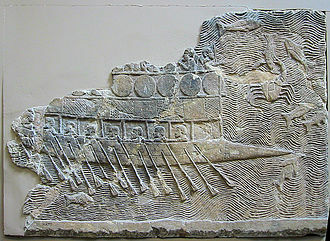 The earliest Greek single-banked galleys are called triaconters and penteconters, for galleys with more than one row of oars, the terminology is based on Latin numerals with the suffix -reme from rēmus, oar. A monoreme has one bank of oars, a two and a trireme three. It was based in the lagoon communities of the historically prosperous city of Venice. 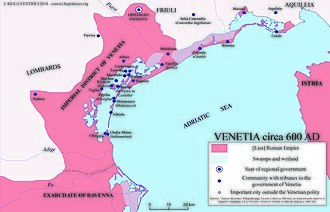 It was a leading European economic and trading power during the Middle Ages, the Venetian city state was founded as a safe haven for people escaping persecution in mainland Europe after the fall of the Roman Empire. In its early years, it prospered on the salt trade, in subsequent centuries, the city state established a thalassocracy. It dominated trade on the Mediterranean Sea, including commerce between Asia and North Africa, the Venetian navy was used in the Crusades. Venice achieved territorial conquests along the Adriatic Sea, the city became home to an extremely wealthy merchant class, who patronized renowned art and architecture along the citys lagoons. Venetian merchants were influential financiers in Europe, the city was the birthplace of great European explorers, including Marco Polo, as well as the classical music composer Vivaldi. The republic was ruled by the Doge, who was elected by members of the Great Council of Venice, the ruling class was an oligarchy of merchants and aristocrats. Venice and other Italian maritime republics played a key role in fostering capitalism, Venetian citizens generally supported the system of governance. 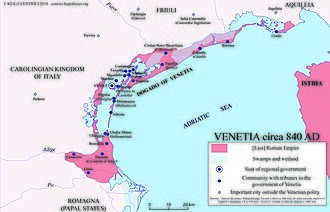 The city-state enforced strict laws and employed ruthless tactics in its prisons, the opening of new trade routes to the Americas and the East Indies via the Atlantic Ocean marked the beginning of Venices decline as a maritime republic. 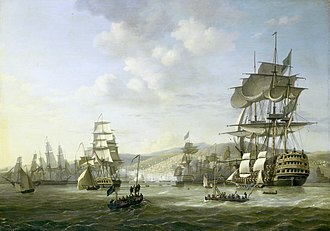 The city state suffered defeats from the navy of the Ottoman Empire, in 1797, the country was colonized by Austria and France, following an invasion by Napoleon Bonaparte. Venice became a part of a unified Italy in the 19th century and it was formally known as the Most Serene Republic of Venice and is often referred to as La Serenissima, in reference to its title as one of the Most Serene Republics. He was the first historical Doge of Venice, whichever the case, the first doges had their power base in Heraclea. Ursuss successor, moved his seat from Heraclea to Malamocco in the 740s and he was the son of Ursus and represented the attempt of his father to establish a dynasty. Occhiali was a corsair who became an Ottoman admiral, Bey of the Regency of Algiers, and finally Grand Admiral of the Ottoman Fleet in the 16th century. Born Giovanni Dionigi Galeni, he was known by several other names in the Christian countries of the Mediterranean. Miguel de Cervantes called him Uchali in chapter XXXIX of his Don Quixote de la Mancha, elsewhere he was simply called Ali Pasha. John Wolf, in his The Barbary Coast, refers to him as Euldj Ali, Uluj Ali was born to the seaman Birno Galeni and his wife Pippa de Cicco, in the village of Le Castella in Calabria, southern Italy. As an oar slave in an Ottoman galley, he participated in the Battle of Preveza in 1538, within a few years, he converted to Islam and became a corsair in the fleet of Turgut Reis by 1541. This was by no means unusual, many Muslim corsairs were captured slaves who converted to Islam. He was a very able mariner and soon rose in the ranks, further success soon enabled him to become the captain and owner of a galley, and he gained a reputation as one of the boldest corsair reis on the Barbary Coast. Uluj Ali was in the fleet of Turgut Reis, one of the most famous corsairs in the Mediterranean, as well as an Ottoman admiral, sailing with Turgut Reis, he impressed the Ottoman admiral Piyale Pasha, with whom Turgut joined forces on a number of occasions. Due to his success in battles, the administration of the island of Samos in the Aegean Sea was awarded to him in 1550, in 1560, he was among the forces of Turgut Reis and Piyale Pasha during the Battle of Djerba. In 1565 he was promoted to the rank of Beylerbey of Alexandria, Uluj took Turguts body to Tripoli for burial, assumed control of the province, and was subsequently confirmed as Pasha of Tripoli by Sultan Suleiman I. In the following years he conducted raids on the coasts of Sicily, Calabria. 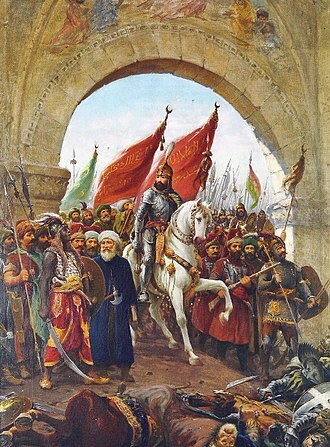 In October 1569 he turned upon the Hafsid Sultan Hamid of Tunis, marching overland with an army of some 5000, he quickly sent Hamid and his forces fleeing and made himself ruler of Tunis. Hamid found refuge in the Spanish fort at La Goulette outside Tunis and this victory caused Uluj to change his mind and return to Algiers in order to celebrate. Tunis is both the capital and the largest city of Tunisia. The greater metropolitan area of Tunis, often referred to as Grand Tunis, has some 2,700,000 inhabitants. Situated on a large Mediterranean Sea gulf, behind the Lake of Tunis and the port of La Goulette, the city extends along the coastal plain, at its core lies its ancient medina, a World Heritage Site. Beyond this district lie the suburbs of Carthage, La Marsa, as the capital city of the country, Tunis is the focus of Tunisian political and administrative life, it is the centre of the countrys commercial activity. Tunis is the transcription of the Arabic name تونس which can be pronounced as Tūnus, Tūnas, All three variations were mentioned by the Greek-Syrian geographer al-Rumi Yaqout in his Mujam al-Bûldan. Different explanations exist for the origin of the name Tunis, some scholars relate it to the Phoenician goddess Tanith, as many ancient cities were named after patron deities. Another possibility is that it was derived from the Berber verbal root ens which means to lie down or to pass the night, given the variations of the precise meaning over time and space, the term Tunis can possibly mean camp at night, camp, or stop. There are mentions in ancient Roman sources of such names of nearby towns as Tuniza, Thinissut. As all of these Berber villages were situated on Roman roads, the historical study of Carthage is problematic. Because its culture and records were destroyed by the Romans at the end of the Third Punic War and these writers belonged to peoples in competition, and often in conflict, with Carthage. Greek cities contended with Carthage over Sicily, and the Romans fought three wars against Carthage, not surprisingly, their accounts of Carthage are extremely hostile, while there are a few Greek authors who took a favourable view, these works have been lost. 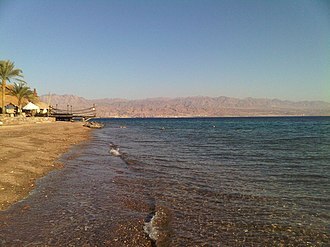 The existence of the town is attested by sources dating from the 6th century BC, in the 2nd millennium BC a town, originally named Tunes, was founded by Berbers and over time occupied by Numidians. In 146 BC, the Romans destroyed Tunis, the city was subsequently rebuilt under the rule of Augustus and became an important town under Roman control and the center of a booming agricultural industry. Habsburg Spain refers to the history of Spain over the 16th and 17th centuries, when it was ruled by kings from the House of Habsburg. The Habsburg rulers reached the zenith of their influence and power and this period of Spanish history has been referred to as the Age of Expansion. 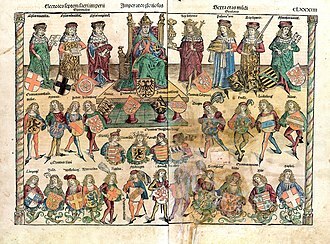 The Habsburg years were a Spanish Golden Age of cultural efflorescence, in some cases, these individual kingdoms themselves were confederations, most notably, the Crown of Aragon. Isabella and Ferdinand were bestowed the title of Most Catholic Monarchs by Pope Alexander VI in 1496, the Habsburg period is formative of the notion of Spain in the sense that was institutionalized in the 18th century. Her husband Philip I was the Habsburg son of the Holy Roman Emperor Maximilian I, shortly thereafter Joanna began to lapse into insanity, though how mentally ill she actually was the topic of some debate. 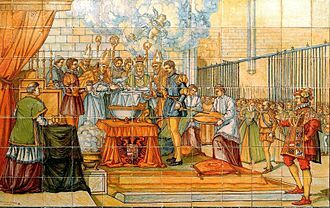 In 1506, Philip I was declared jure uxoris king, but he died that year under mysterious circumstances, possibly poisoned by his father-in-law, Ferdinand II. Since their oldest son Charles was only six, the Cortes reluctantly allowed Joannas father Ferdinand II to rule the country as the regent of Joanna, Spain was now in personal union under Ferdinand II of Aragon. He attempted to enlarge Spains sphere of influence in Italy, as ruler of Aragon, Ferdinand had been involved in the struggle against France and the Republic of Venice for control of Italy, these conflicts became the center of Ferdinands foreign policy as king. The war was less of a success than that against Venice, Ferdinand would die that year. Ferdinands death led to the ascension of young Charles to the throne as Charles I of Castile and Aragon and his Spanish inheritance included all the Spanish possessions in the New World and around the Mediterranean. Upon the death of his Habsburg father in 1506, Charles had inherited the Netherlands and Franche-Comté, in 1519, with the death of his paternal grandfather Maximilian I, Charles inherited the Habsburg territories in Germany, and was duly elected as Holy Roman Emperor that year. At that point and King Charles was the most powerful man in Christendom, the accumulation of so much power by one man and one dynasty greatly concerned Francis I of France, who found himself surrounded by Habsburg territories. In 1521 Francis invaded the Spanish possessions in Italy and Navarre, the war was a disaster for France, which suffered defeats at Biccoca and Landriano before Francis relented and abandoned Milan to Spain once more. Charless victory at the Battle of Pavia surprised many Italians and Germans, Pope Clement VII switched sides and now joined forces with France and prominent Italian states against the Habsburg Emperor, in the War of the League of Cognac. Henry VIII of England, who bore a grudge against France than he held against the Emperor for standing in the way of his divorce. Although the Spanish army was defeated at the Battle of Ceresole, in Savoy Henry fared better. The Austrians, led by Charless younger brother Ferdinand, continued to fight the Ottomans in the east, with France defeated, Charles went to take care of an older problem, the Schmalkaldic League. The main façade, from the Plaza del Ayuntamiento. Alfonso VI of León and Castile (right) in a miniature from the Codex Calixtinus made in 1145. With its highly indented coastline and large number of islands, Greece has the longest Mediterranean coastline. 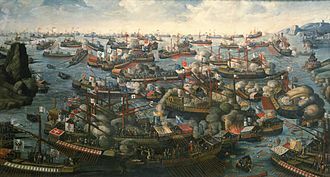 The Battle of Lepanto, 1571, ended in victory for the European Holy League against the Ottoman Turks. Roger II, the first king of Sicily. Maximal expansion of the Kingdom of Sicily. Grand Master Pierre d'Aubusson with senior knights, wearing the "Rhodian cross" on their habits. Dedicatory miniature in Gestorum Rhodie obsidionis commentarii (account of the Siege of Rhodes of 1480), BNF Lat 6067 fol. 3v, dated 1483/4. "Piae Postulatio Voluntatis". Bull issued by Pope Paschal II in 1113 in favour of the Order of St. John of Jerusalem, which was to transform what was a community of pious men into an institution within the Church. By virtue of this document, the pope officially recognized the existence of the new organisation as an operative and militant part of the Roman Catholic Church, granting it papal protection and confirming its properties in Europe and Asia. 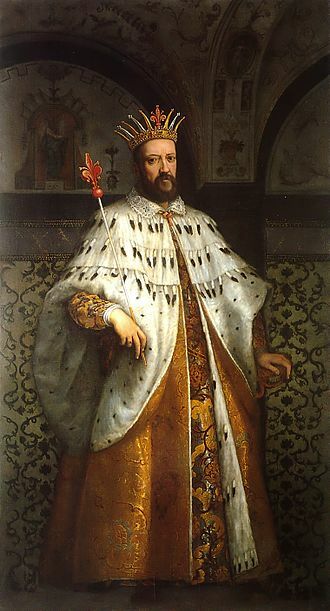 The Grand Duke Ferdinando I.
Cosimo I de' Medici in coronation robes, with Grand-ducal regalia By Cigoli. The English-built Charles Galley, a "galley frigate" built in the 1670s. It was not a "true" galley, but the term still became part of its name due to its oars. Watercolor of United States ships at the battle of Valcour Island, depicting several "row galleys"; similar function, but based on very different designs than Mediterranean galleys. Oil in canvas, 2nd half of 16th century, probably by Juan Pantoja de la Cruz. Museo del Prado, Madrid. Portrait, ca. 1559-60 by Alonso Sánchez Coello. Portrait, ca. 1560 by Alonso Sánchez Coello. John of Austria in armour, by Alonso Sánchez Coello, 1567. Aroeira 3 skull of 400,000 year old Homo heidelbergensis, the oldest trace of human history in Portugal. The Megalithic Monuments of Alcalar, built in the 3rd millennium BC Southern Portugal, now the Algarve. 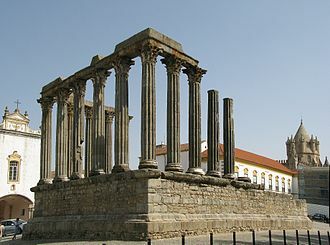 Roman Temple of Évora, in the Alentejo, is one of the best preserved Roman-built structures in the country. 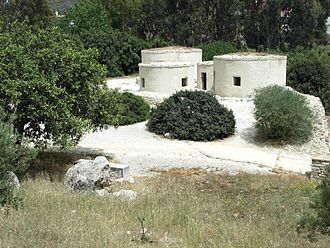 Centum Cellas, in the Beira region, is a Roman villa rustica from the 1st century CE. The Berber Roman client King Ptolemy of Mauretania. Ancient Roman ruins of Volubilis. Idrisid coin, minted at al-'Aliyah (Fes), Morocco, 840 CE. A memorial rock for the disembarkation point of Admiral Zheng He in 1405. The replica of Malacca Sultanate's palace which was built from information and data obtained from the Malay Annals. This historical document had references to the construction and the architecture of palaces during the era of Sultan Mansur Shah, who ruled from 1458 to 1477. A bronze relief of Hang Tuah, a legendary Malay hero. Exhibited at the National History Museum, Kuala Lumpur, Malaysia. The surviving gate of the A Famosa in Malacca. Vittore Carpaccio. Young Knight in a Landscape. The castle on the left has been identified with Methoni, and the knight with Marco Gabriel, its rector during the Ottoman siege of 1500. Lifting of the Siege of Malta by Charles-Philippe Larivière (1798–1876). Hall of the Crusades, Palace of Versailles. 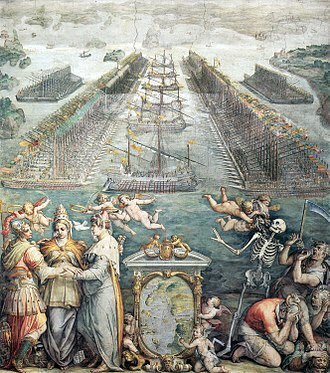 Order of battle of the two fleets, with an allegory of the three powers of the Holy League in the foreground, fresco by Giorgio Vasari (1572, Sala Regia). One of the Venetian Galleasses at Lepanto (1851 drawing, after a 1570s painting). Ottavio Farnese, bust in Milan, Sforza Castle. Engraving of a galleass from Plan de Plusieurs Batiments de Mer avec leurs Proportions (c. 1690) by Henri Sbonski de Passebon. Engraving by Claude Randon.